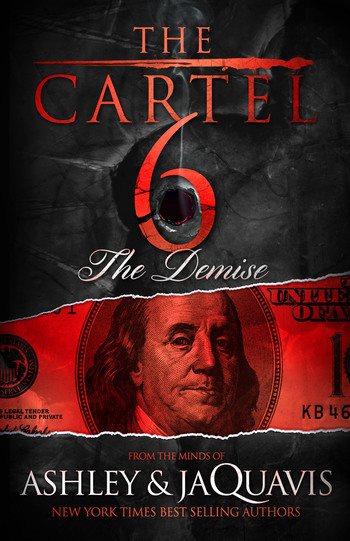 The Cartel series is back...and more deadly than ever. Las Vegas. A city built on obscene wealth and corrupt deals, cunning entrepreneurs, and the ruthless mob. The Cartel's plan to open a casino will rake in cash, but comes with great sacrifice. The stakes have never been this high, and rules of the game have never been this hard to manipulate. And when one dead girl, one scorned wife, and one hole in the desert launch a chain of catastrophic events, The Cartel is sent on a downward spiral as they battle the Arabian mob and fight traitors within their circle. Will the Cartel prevail...or fall victim to the city's black cloud? And if there's one rule in the town of Vegas, it's that when the dust settles, there can only be one winner, in The Cartel 6: The Demise, by New York Times bestselling authors Ashley & JaQuavis. Ashley & JaQuavis are New York Times bestselling authors of over 30 novels, including the Cartel series; the Luxe and Prada Plan series from Ashley Antoinette; and The Streets Have No King and The Stiletto Agreement from JaQuavis Coleman. They are the youngest black writers to ever debut on the prestigious New York Times list. Ashley Antoinette is a writer for the hit VH1 series, Single Ladies, whiel JaQuavis Coleman is directing film projects for legendary rap artists, Prodigy and Scarface.